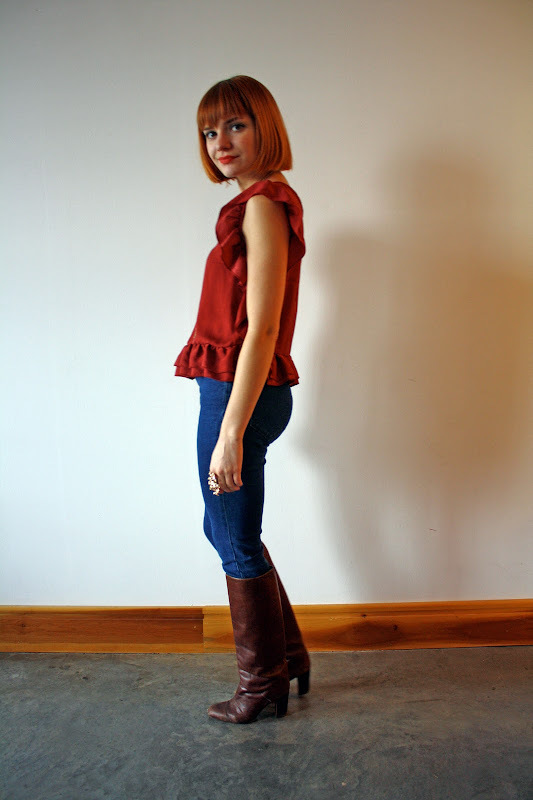 My go-to outfit of late has been a top with pretty details, jeans, boots and a couple of customary statement accessories to complete the look. This new blouse almost had me convinced with its ruffles and festive hue, but the back was definitely the kicker for me. I'm such a sucker for any kind of open back detail. On a more general note, I know posting has been rather lackluster around here, and I wanted to thank you for bearing with me! I've been feeling a bit off in terms of inspiration and motivation. These spells tend to come and go for me, so I'm doing my best till it passes. Maybe the new year will kick me into gear! Such an awesome top! I love ones with open backs too, the ruffles are very sweet as well. This may sound snarky, but I'm honesty curious: Do you have to wear a special bra with tops like this? Because I just can't go bra-less, especially in the winter. I love open back details too, but I'm always afraid to wear them. Tell me your secrets! love the boots and the back of the blouse! This is such a simple and beautiful outfit. For this top, I wear a strapless bra with the back pulled down below the opening. I also sometimes wear those "sticky cups" that don't have a back strap, but they're kind of a pain. I have a small chest, so I don't need much support. I know it can be tricky if you have a larger chest. Good luck! I love this outfit; it's simple but still very chic. So awesome. That top is to die for, too! Surprise keyhole! That top is adorable, and the color is beautiful on you. What a pretty blouse! I love the peekaboo back! Your so cute I love your outfits!! That top is such a gorgeous color. Love this look! I'm also a sucker for an open back...when you're got it, flaunt it, gurrrl!! :) And I feel you on the lack of inspiration... I don't know how those girls who post everyday think they are coming up with interesting outfits everyday -- we're bloggers, not freakin' magicians!! Hehe... Have you joined Pinterest? Lots of inspiration over there!! That top is awesome. The cutout in the back is the best! 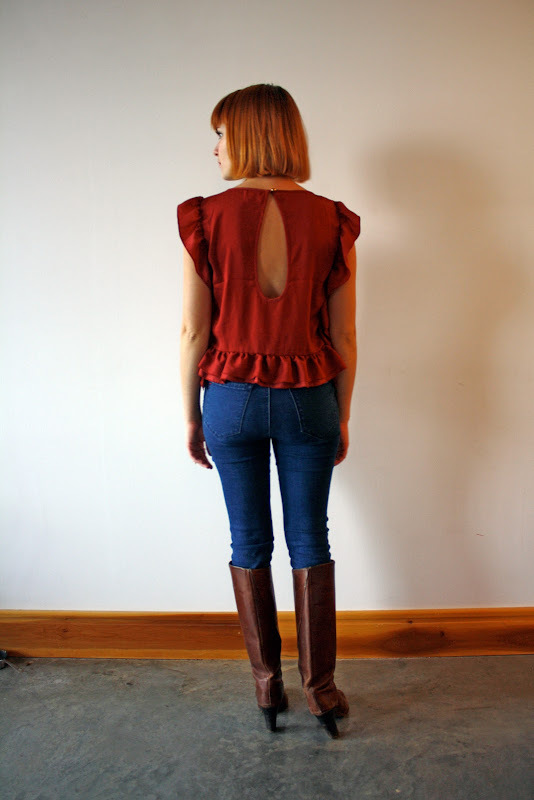 Love this whole outfit... from the burnt orange of the shirt, the cutout detail on the back, and those amazing boots. pretty top! you look great!